Our single-origin coffees are selected for both quality and flavor, from small farms and estates who take extra care in how they grow and prepare their coffee. Evansville Coffee Single Origins change often, giving you the opportunity to enjoy an array of coffees year-round. Notes of cherry with cane sugar and caramel. Not a blend! 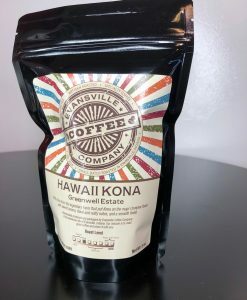 This is 100% pure Kona from the legendary farm that put Kona on the map Complex flavor with sweet aroma, floral and nutty notes, and a smooth finish. 5 oz. bag. Smooth creamy body, slight sweetness cherry and caramel. Well balanced, juicy body with a sparkling citric acidity. Sweetly tart; black currant, dark chocolate, citrus notes. Jasmine, tart cherry, toffee and a heavy mouthfeel. Delightful citrus and toffee notes. Oh. My. Goodness. I just got my first bag of Sumatra and it is beyond amazing!!! It's roasted perfectly and is so full of flavor.